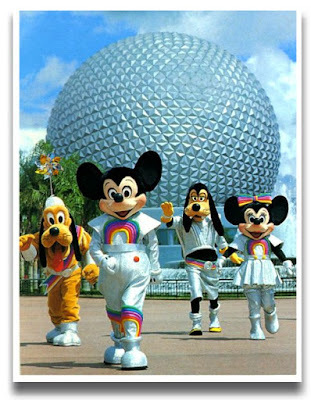 Jeff over at Hyperion 2719 has this photo from the 1980s of assorted Disney characters in their futuristic rainbow costumes. When I was a kid I wanted to visit Epcot so badly. Never got there, it just seemed like another planet to a kid growing up in Ireland. Who builds geodesic domes these days? The geodesic dome's inventor, Buckminster Fuller, still has a cult following. But that doesn't make much sense because his inventions haven't really worked well. Mark Plus: have you seen the Eden project in England? have you seen the Eden project in England? No. Judging from the website, it reminds me of the Climatron (a paleo-future neologism, if I've ever see one!) in St. Louis, which I have seen. In other contexts, geodesic domes just look increasingly dated. BTW, I live about ten miles from Arcosanti, another moribund architectural experiment from the paleo-future era. For someone into radical rethinking & 'arcology', Arcosanti's founder has an astoundingly mediocre apartment. And the bell foundry. How very 60s to believe you can support a community by making bells which, no doubt, were symbolic of man's need to wake up. I knew it! I know where the Teletubbies creator got the idea of putting creepiness on children show.